← 1shot #179-u mad bro? This is Charlie. He is 6 years old. 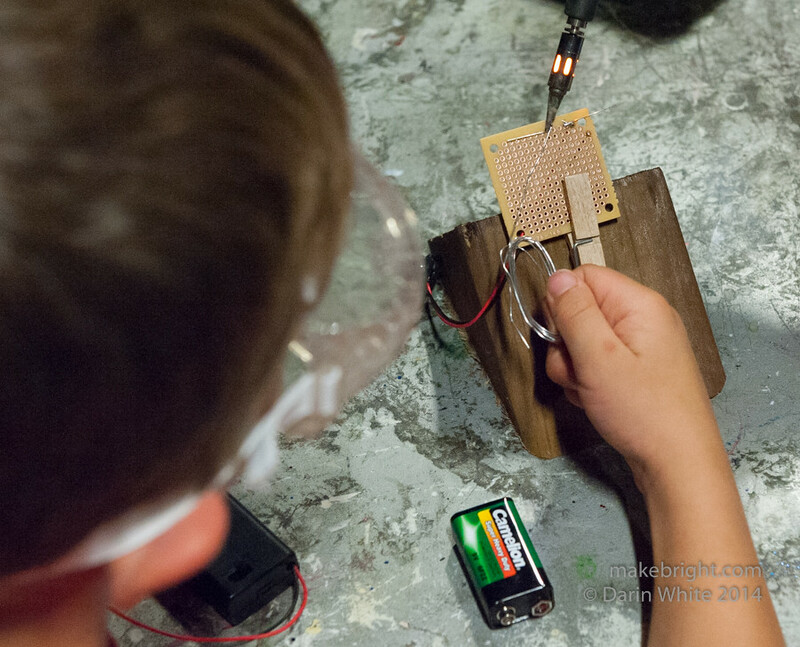 With a little help from his Aunt Dinah combined with gear/know-how/meetup from Maker Club, Charlie is learning how to solder. It is the most fundamental skill required to jump off into the very interesting domain of electronics. Mastering the skill helpfully starts to demystify all the electronic bits of our world from garage door openers to microwaves to smartphones. It also equips him to repair, repurpose, and invent. There is a notion that all children are naturally artists and it is only through negative feedback or maybe a lack of support that this awesome predisposition is squashed. “What is it?” “Why did you make that?” “What is it good for?” “You did it wrong.” The same dynamic certainly applies to young makers. 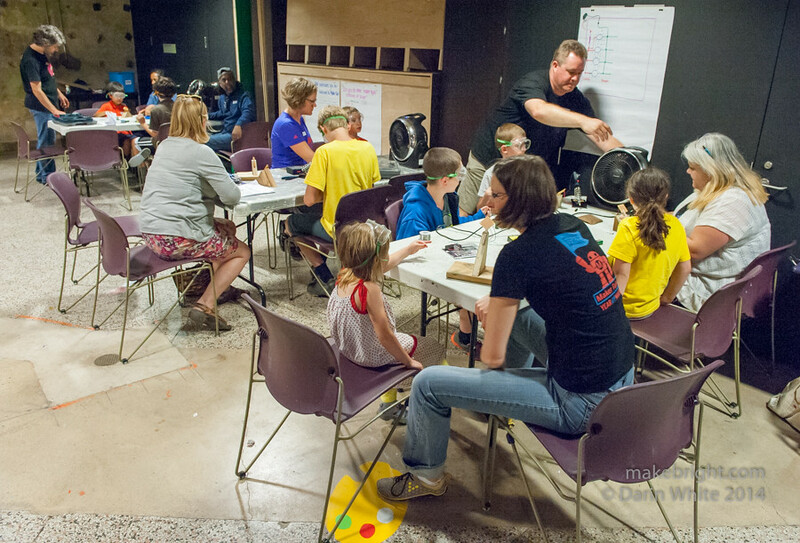 Happily, there are some super-committed people in the make-o-sphere like Cam Turner and Tanya Morose, running their monthly Maker Club for kids in THEMUSEUM. They’re teaching a variety of makerly skills through hands-on projects. I caught up with them on the 2nd Wednesday of the month last week to check it out. 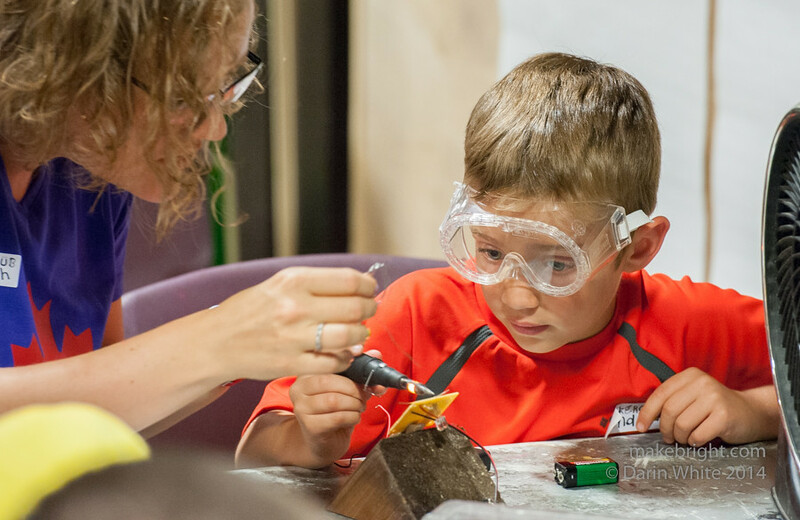 The TL;DR: Maker Club needs knowledgeable helpers, workshop leaders, tools, and a whack of kids who are eager to learn and do. Click through for the long form. 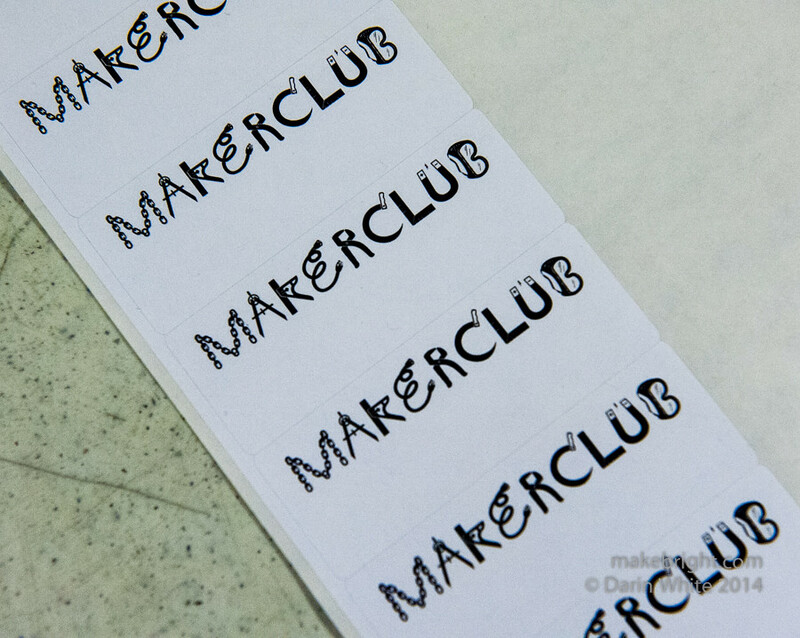 The Maker Club name tag hints that projects range well beyond electronics and soldering. Before you learn to solder, you spend a lot of time trying to make circuits by twisting wires together, or taping them, or being constrained by kits that snap together. And sometimes, you give up. My grandfather taught me to solder when I was 10 years old. It was like cracking open a book of magic spells and it unblocked a lot of projects that had been cooking in my head. These days, grandparents are often far afield or they themselves are lacking some of the basic maker skills, leading to a generational interruption of know-how. With the popular rise of the maker movement, recovering from that gap is now easier than it has been for decades. You just need to know where to look. 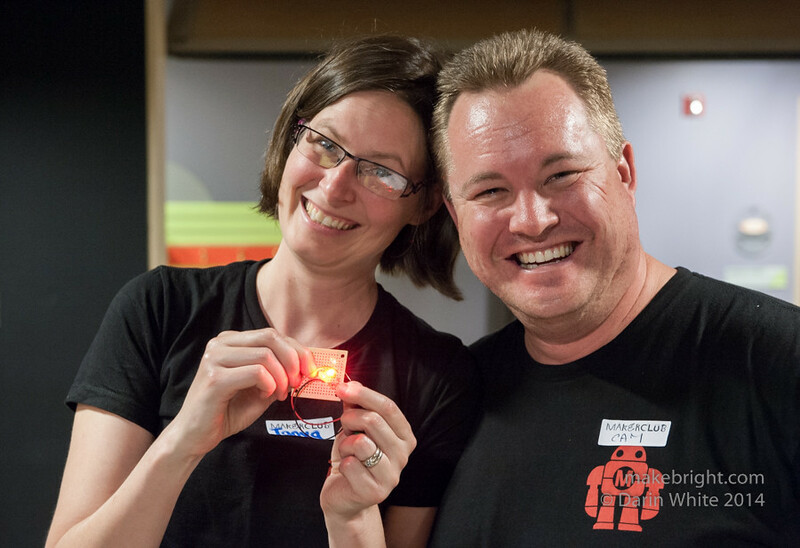 When you talk with Cam and Tanya from Maker Club, and also James Arlen from Think|Haus makerspace, you can really hear the passion for enabling kids as makers. Maybe I should say: preserving, encouraging, and equipping kids as makers. I always tell my kids they need to be smarter, more capable, and more resourceful than my generation to save us all from ourselves. I suppose we could consider Maker Club a boot camp for that mission. 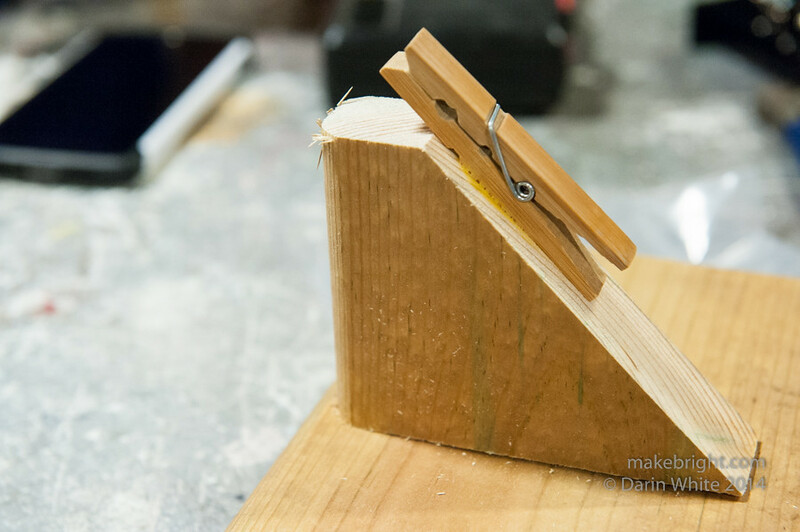 I love this makeshift clamp for holding parts while they’re soldered. Made from leftover ends of Cam and Tanya’s deck. 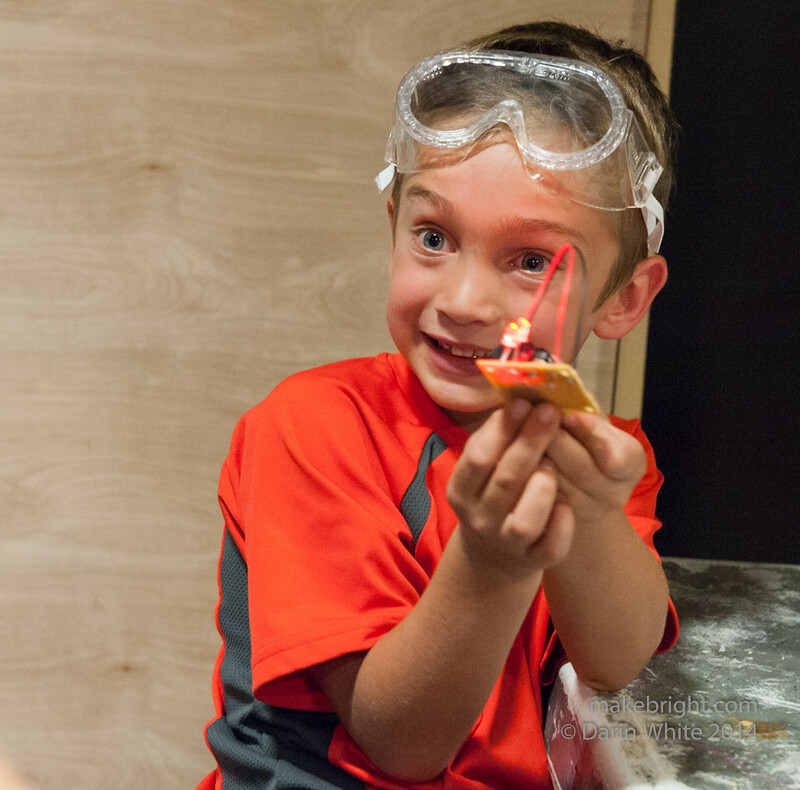 There is a ton of free maker education material online. And, while there are lots of workshops to help you get started, I encourage all families to just dig in. Be brave, people. Read, buy $20 worth of tools and a $20 kit, and get to work. 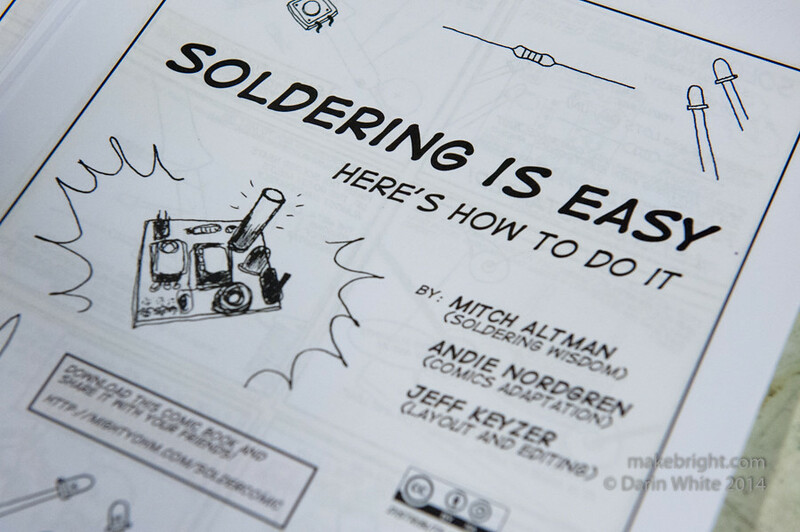 I joined this soldering workshop (above) a couple years back when Mitch Altman dropped into kwartzlab for the day. 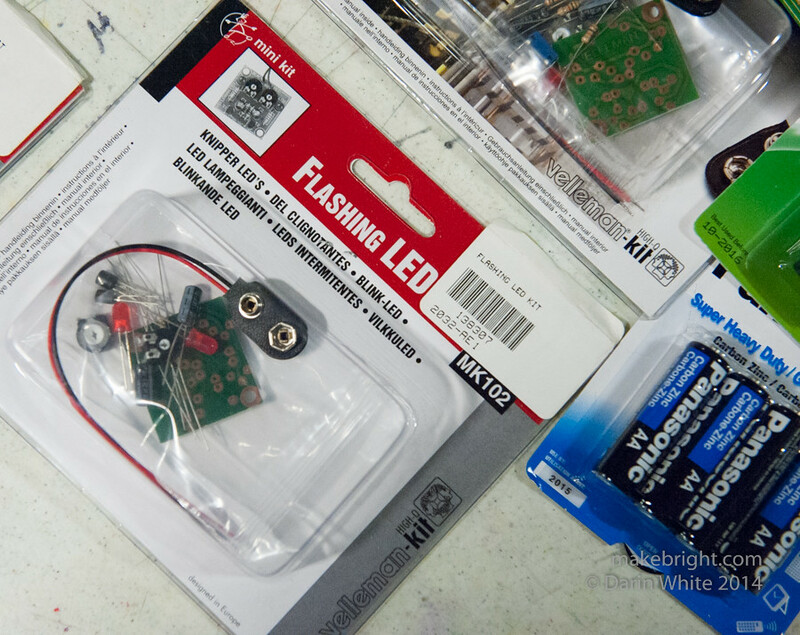 I did another soldering workshop at Maker Faire in San Mateo a few years back. I joined in a soldering workshop that kwartzlab ran at THEMUSEUM for Halloween. I even ran a soldering class out of my garage back in the day. I keep coming back because I’m more of a helper than a student and paying it forward keeps these workshops available and spawns new ones. Here’s the homework from Maker Club: once you got the basic skills down, you could take this kit home and solder it up for blinking lights. 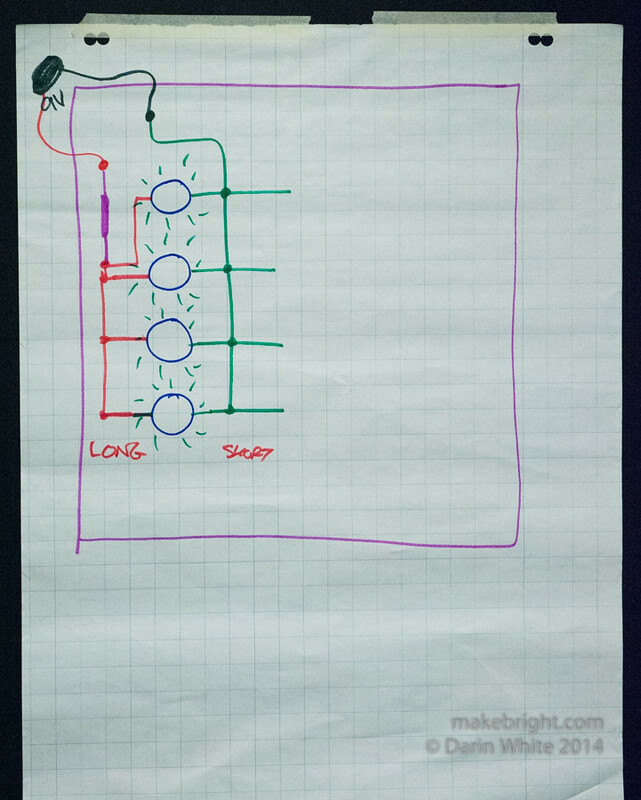 Cam’s workshop circuit was appropriately simple: make some LEDs light up. Above, the humble LED. The D in LED is diode, and diodes conduct current in only one direction (generally). If you put them in backward, you don’t get light. So even in this simple project, there was an opportunity for Charlie (and Aunt Dinah) to learn about diode behaviour. 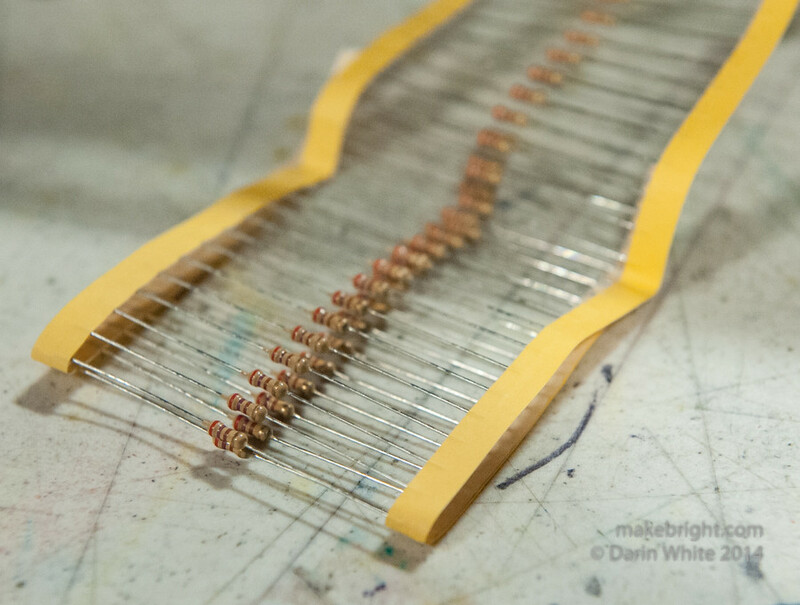 Of course LEDs are hungry for current, so you’ve gotta slow down their consumption with one of these: the humble resistor. More learning. Entry level and perfectly usable soldering iron. Probably $20. Battery, LEDs, a resistor. Simple, but there were all sorts of practical opportunities for learning. Some kids learned about cold solder joints that don’t conduct. Some kids learned that a serial circuit of LEDs behaves differently than this parallel circuit shown above. 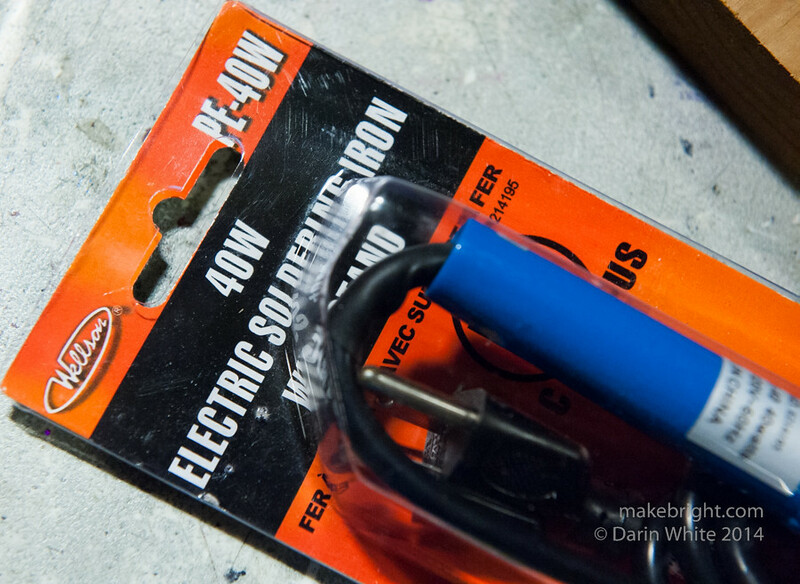 Everybody learned that you gotta scrape enamelled magnet wire before you can solder it. 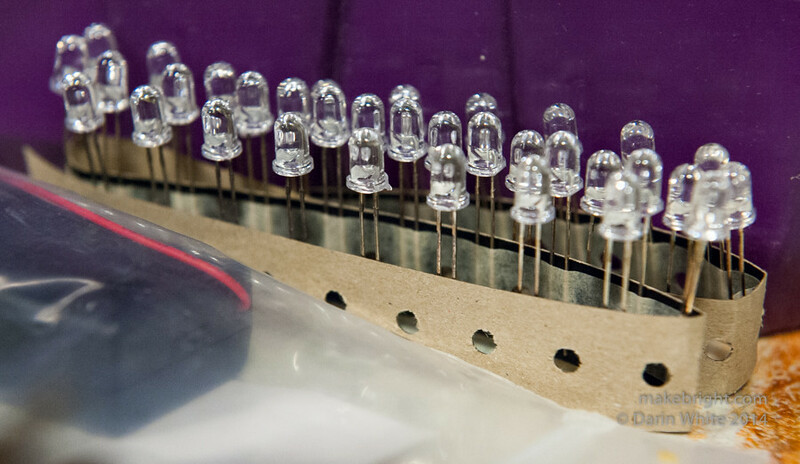 Everybody learned that how you choose to arrange the LEDs and resistor on the perf board can make it hard or easy to solder. When things go wrong is when the real learning starts. Kudos to THEMUSEUM for hosting Maker Club in their space on King Street in Downtown Kitchener. When you’re lighting up a workshop series, even things like tables, chairs, and washrooms are things you need to think about, let alone liability insurance. Hey, did some fingers get burnt? Of course, but that’s how you really learn about the hot and the cold end of a soldering iron. It’s also the reason that parents are required to stay and participate with their kids. 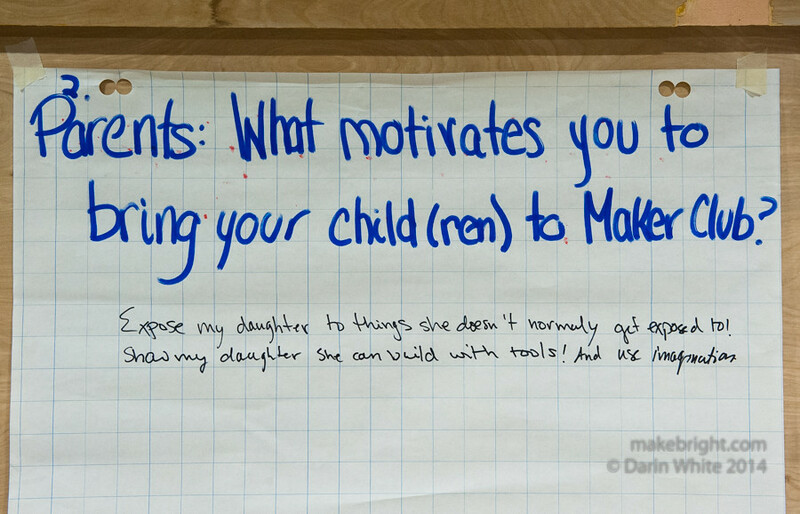 Jason Hawreliak, from the UW maker study on which I’m advising, was on hand to talk with parents and kids alike about their reasons for coming to the workshop. Might be some more news to share around that, shortly. Tanya and Cam, gettin’ it done. Trust me: this type of endeavour is a huge amount of work, especially in the beginning, and running in parallel with raising a young family and managing busy careers. If you can help ‘em out, make it so. Pretty cool to think what Charlie might be working on in 20 years. This entry was posted in the make-o-sphere and tagged Kitchener, Maker Club, THEMUSEUM. Bookmark the permalink. Charlie is my son. My sister Dinah brought him, it was his first time at maker club! I think we are committed to going now as Charlie won’t take no for an answer! He was so excited when he got home to show us what he had created, what an awesome way of empowering our children! We really had a great time! I hope we get to do another electronics project in the future so my daughter can try it out as well. She was visiting her grandparents so I got to bring Charlie instead! Glad I did. He had a great time! Thanks for the Diode help Darin! Thanks so much for joining us in July! I freely admit that I was a bit nervous giving kids lead solder and a hot solder iron (ugh, so many things could have gone wrong), but it all worked out in the end. We’re teaching kids to use real tools, safely, and every month they blow me away with their creativity, imagination, attention to deal and ability to follow (general) instructions yet make the project their own.